Nothing’s changing this December as he competes for the first time in the sport’s grand finale, the Wrangler National Finals Rodeo. On Tuesday night, he rode the Korkow Rodeo horse Vidalia for 83.5 points, good enough for fifth place in the sixth go-round and a check worth $4,519. In all, the feat moved his NFR earnings to $22,314 and his season earnings to nearly $105,000. The 10-round marathon is a test of the cowboys’ skills and fortitude. Playing on the biggest stage in the sport has its own challenges, but doing so on the backs of the toughest horses in the game is the biggest. 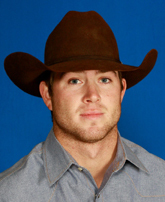 Scheer has placed in three go-rounds, but he bucked off his third-round bronc. Still, he sits seventh in the all-important average race with 407.5 cumulative points on the five qualified rides. But it doesn’t get any easier. For Wednesday’s seventh go-round, Scheer has been matched through the blind draw with Bar T Rodeo’s Round Robin, a horse that Australian Sam Spreadborough rode for just 74.5 points, well off the pace to reach the pay window; only the top six contestants in each go-round earn a check.